The Playa de Oro International Airport code is ZLO. Depending on your hotel location, the trip to your hotel in Manzanillo will most likely be somewhere between 22 and 28 miles. If you don't have any pesos when you arrive, there is an ATM machine in the airport. Most tourist towns will accept US dollars, but the exchange rate they will give you isn't too good. So grab some pesos from the ATM machine when you get here and it will convert your currency at official exchange rates. As with most Mexico resort destinations, Manzanillo has a tourist zone which was built after the city was laid out. So in Manzanillo, you will find that the tourist zone is on the North side and includes anything you can think of related to tourism (gift shops, stores, travel agencies, tour operators, hotels, restaurants, beaches, etc.). On the South side of town, you will find the banks (if you need more than an ATM machine), government offices and the Market district. The growth of Manzanillo into a world class vacation destination is actually similar to the story of its neighbor (Puerto Vallarta). In the 1950's, PV was a place the wealthy in the know would go to escape. Then came "The Night of the Iguana" . . . a popular movie by Director John Huston with Richard Burton & Ava Gardner (released in 1964). -- Tourism boomed and a world class vacation destination began to take shape. The Las Hadas Resort (now part of the Las Brisas chain) built in the early 1970's put Manzanillo on the map for the ultra-rich jet set crowd looking for an out of the way place to escape. Then in 1979, Bo Derek and Dudley Moore put Las Hadas on the map for the rest of us when the Blake Edwards film "10" appeared in theaters. So you see . 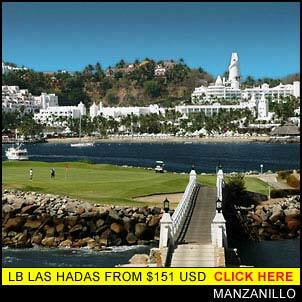 . . it's not an exaggeration to say that Manzanillo owes its status as a world renowned resort destination to the Las Hadas Resort (and the movie "10"). Sadly, the beautiful piano bar in the movie no longer exists . . . but then nothing remains the same forever. If you are considering Manzanillo Mexico as your vacation destination and haven't seen the movie "10" . . . rent it today! Then click on the link below the picture above and make your reservation!!! Manzanillo is a destination with great beaches, great resorts, and a quasi-modern tourist town to get out and shop in. . . And in spite of its success as a tourist destination, the city of Manzanillo is still fairly small with a population of around 115,000 people. Manzanillo tourism began because it was a reclusive destination with all the amenities offered by a mega-resort. Now it is bigger than it was in the 70's . . . but it still retains much of the reclusive flavor that celebrities tend to favor.